Andy Peaks knows AFC Rushden & Diamonds will have to be “at their best” if they are to cause one of the upsets of the second qualifying round of the Emirates FA Cup this weekend. 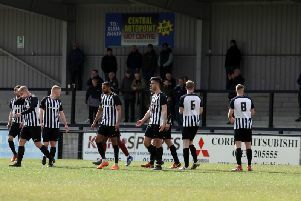 Diamonds, who are unbeaten in five matches following their dramatic 3-3 draw with Gresley FC in the Evo-Stik Northern Premier League Division One South in the Dog & Duck last Saturday, make the trip to take on Vanarama National League South bottom markers Concord Rangers. Boss Peaks got a first-hand look at tomorrow’s (Saturday) opponents when he watched their 1-0 home defeat to Wealdstone on Tuesday night. And, despite Concord’s struggles at the start of the season, the Diamonds manager is under no illusions of the task facing his in-form team. “It’s a big game for the club,” he said. “It’s an opportunity to go to a team two levels higher than us and hopefully we can go there and give a good account of ourselves. “I watched their 1-0 defeat on Tuesday but event the guys from Wealdstone admitted they rode their luck. “Concord hit the post, hit the bar and probably should have won the game. As far as I could see, they are in a false position. “But they are on a tough run so it will be up to us to go there and start well and see where it takes us. Peaks revealed both Jack Ashton and Lewis Leslie “have a chance” of being fit for the clash but Jake Newman and Joe Curtis remain long-term absentees. Diamonds, meanwhile, will wear black armbands for tomorrow’s tie in memory of Shaw Lane AFC player Daniel Wilkinson, who tragically passed away after he collapsed on the pitch during a game on Monday night. There will also be a minute’s silence before this weekend’s cup tie and Diamonds will be keeping touch with Shaw Lane officials during the coming week ahead of their scheduled league game against them at the Dog & Duck a week tomorrow.